Being able to identify and generate equivalent fractions is a tremendously important skill in Common Core arithmetic and algebra alike. Fourth graders use pictures and reasoning to write equivalent fractions. but it isn’t a more correct form. These two fractions mean the same thing. are somehow different from each other. In fact, they’re the same; they’re equivalent. In many classrooms, the term simplify replaces reduce to avoid these problems. Simplify suggests that the fraction is in a simpler form — using smaller whole numbers in the numerator and denominator — but that it’s the same fraction. Students may generate equivalent fractions by drawing pictures, as in the following example. by cutting each of the ninths into two same-sized pieces (in the middle of the figure). You have twice as many pieces in the whole (18 instead of 9), and you have twice as many pieces shaded (12 instead of 6). as the right-hand side of the figure shows. Your child’s teacher or textbook may refer to these pictures as area models, because you pay attention to the fraction of the area of the square (or rectangle, or circle, or whatever) that is shaded. The next figure shows this same process using a number line. 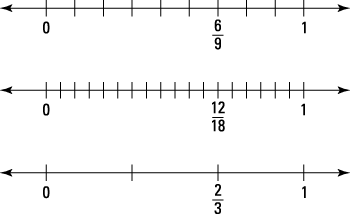 Equivalent fractions using number lines.